Here Michael is leading our prayer request time, Prayers of the People, beginning as he always does with a plea for prayer for all of those struggling with addictions. As a way of participating and affirming, the congregation lifts and shakes their shakers after each individual request. 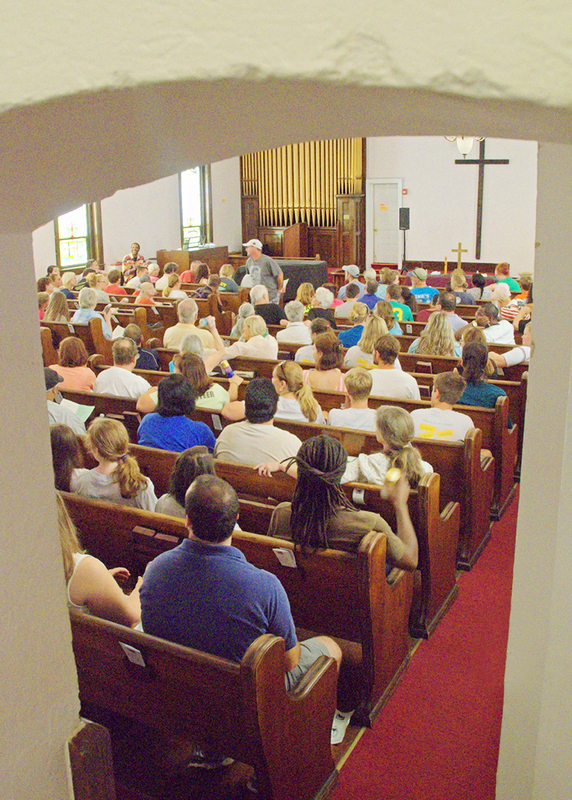 Worship during the summer is even livelier than usual, and we often are blessed to have a packed house, including the balcony. With our seminary interns, returning college students, youth mission teams with CCC and AYM, and others who just find themselves in Asheville on vacation, our attendance has sometimes been standing room only. We are NOT complaining — please come join us at 12:30 p.m. on Wednesdays!